It’s funny how you look at things differently when you’re a physician or healthcare provider. I’m always noticing automated external defibrillators (AEDs) when I’m in public places, especially now that they’re nearly everywhere. Most places have them prominently displayed with clear signage and the cases are either red or bright yellow so they’re easily seen. 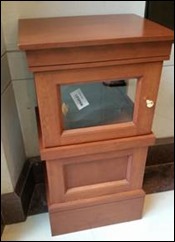 When I was recently on Capitol Hill, however, I noticed that the AED of Congress sits in a nondescript pedestal in a subdued black case. No matter where your politics lie, it’s somewhat ironic that Congress operates in a different world than what most of us know. Since the Meaningful Use rules were published earlier this week, hundreds of health IT people were spending thousands of hours poring over them. Several of my colleagues lamented that it was a huge waste of time since there’s a high likelihood that Congress will create legislation to delay the start of Stage 3 beyond 2018. Without my crystal ball, though, to know if that will be true and when it will happen, I had to dig into all 1,300+ pages of goodness like everyone else. You know you’re an informatics geek when you’re joining your informatics friends in tweeting photos of the cocktails you’re drinking while you’re simultaneously reading federal regulations. After a while, they became mind-numbing and I just had to quit and go to bed. When I woke up, I unfortunately did not discover that MU had all been a dream. I did discover invites to some CMS webinars, though, which helped provide an excuse to procrastinate the reading until I could listen to the highlight reel. I tried to register for the webinar, but kept getting a Windows Live Meeting error. It finally registered me after trying multiple times over the next several hours. I started working some issues with my clients and discovered that one of them only sent out 70 claims for the first two days on ICD-10. Although they didn’t experience any unusual rejections, that’s a fraction of the number of claims that should have gone out with the average physician seeing 30 patients per day and this being an organization with more than 100 physicians. My client is the IT department. They engaged me to figure out what’s going on. After entirely too many phone calls, we determined that apparently the operations team decided to switch to a system where 100 percent of patient visits receive review by a certified coder. Unfortunately, they didn’t let anyone on the IT side know, so IT has been chasing their tails trying to figure out what is going on. Although 100 percent review certainly reduces your risk of miscoded claims, it’s not realistic in most organizations. I think these folks just gave themselves a self-inflicted cash flow problem. I gave the IT department some advice on how to quickly transition from 100 percent review to representative sampling, but I’m not sure they’re going to be able to get the operations management to listen. Fast forward to Thursday, when I attended the CMS Medicare and Medicaid Electronic Health Record (EHR) Incentive Programs Final Rule Overview webinar. I’m curious about the inclusion of an additional 60-day public comment period. Although HHS is “committed to working with stakeholders,” what are they really going to do with the information? The comment period is limited to Stage 3, so it sounds like they’re leaving the door open for further changes even if Congress doesn’t act. Webinar pro tips from a seasoned trainer: when you do introductions, put up a slide that lists the name and credentials of the person speaking. The first speaker was introduced so quickly I barely caught her name. The entire time we were looking at the title slide for Elizabeth Holland, who was the second speaker. Her title, however, was not listed. Although many people know “everyone” in the MU community, not everyone knows exactly who you are and why you’re speaking. She did apologize for the overloaded webinar and that people that were turned away – it should have been something they could have anticipated based on the issues with the registration. Due to the vastness of the 752-page rule, the webinar largely focused on modifications to Stage 2 and in particular what we need to know for 2015. Attendees were encouraged to read the entire document to find responses to their questions. No flexibility in using CEHRT certified to previous edition criteria. Providers must use 2014 Edition CEHRT in 2015 and subsequent years until they transition to 2015 Edition CEHRT, which is required for reporting in 2018. Much emphasis on aligning 2015-2017 Modified Stage 2 measures to Stage 3, which will be required for everyone in 2018. Alternate measures and exclusions remain largely unchanged from the proposed rule. These help providers who planned to attest for Stage 1 or Stage 2 to be able to meet Modified Stage 2. These were essential since the rule was released later than anticipated. They’re fairly detailed and were addressed as each measure was covered. I got lost in the details on a couple of them, so I’ll do like the presenter and refer you to the Final Rule for details. CPOE landed at 60 percent for medications, 30 percent for labs, and 30 percent for radiology. Hospitals are at 10 percent of discharge meds meeting the same criteria. Transition of care requires use of the CEHRT to create a summary of care record; more than 10 percent of transitions of care and referrals must be transmitted electronically. Patient education is 10 percent for EP unique patients seen during the reporting period and also 10 percent for EH patients admitted to the inpatient or ED places of service. Medication reconciliation remains at 50 percent of transitions of care to the EP or EH/CAH. Patient electronic access threshold is 50 percent to receive access within four days for unique patients seen during the reporting period. For 2015-15, only one patient seen during the reporting period must view, download, or transmit. This goes up to 5 percent in 2017. Hospitals must provide access within 36 hours of discharge for more than 50 percent of patients. The VDT thresholds are the same. Secure messaging has to be enabled for the reporting period in 2015 on a yes/no basis. For 2016, at least one patient must engage in secure messaging. For 2017, this goes up to 5 percent. No changes to CQMs and the period is 90 continuous days. Removes redundant, duplicative, and topped out measures (no surprises here) and intended to reduce provider burden. Not sure it meets the mark on the latter. The presenter started talking about specific measures and their changes without a supporting slide. I got completely lost. They were not reviewed in detail. The comment period closes December 15. Update your registration information through NPPES including email and payment information as well as surrogate users. Ensure your 2014 Edition EHR identification information is documented. Reporting periods are any continuous 90 days in the calendar year except for hospitals, which can go back to the last quarter of 2014. Attestation opens January 4, 2016 and runs through February 29, 2016. If users claim they can’t meet the requirements because the rule was so late, they should apply for a hardship exception. Expect the FAQ to be up shortly. I didn’t really expect it, but I would have liked to have them at least acknowledge the fact that they put a 90-day reporting period in place for this year, yet announced the requirements after the last possible 90-day period had already started. I know that’s what all the exclusions are about, but it just seems overly complex when it’s supposed to be simplifying and consolidating things for us. Being able to acknowledge a mistake is also a good customer service move. Vendors still have to support multiple sets of reporting and performance criteria. As a side note, I’ve never heard the CAH abbreviation for Critical Access Hospitals pronounced as “Caaaa,” so that was a bit jarring every time I heard it. Please excuse any typos or errors in my summary. I’m frantically typing it after a long day of “real job” work so Mr. H can get it to press. Have you finished the rule? What are your thoughts? Email me. Dr. Jayne: For your MU review, how about some MU-inspired cocktails? MU3-Olive Martini, MU Julep, A-MU-Retto Sour, MU-hattan? Perhaps a nice glass of MUrlot?